SEP 3T The SEP 3T servo electric press incor- porates an automatic shuttle system to the proven ASG press line for fast and simple prod- uct presentation. 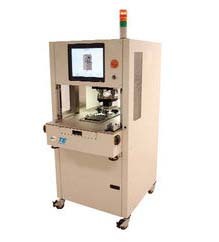 Focused at the application of PCB’s onto compliant pin housings, this system is provided with full control and monitoring of force, distance and speed for quality assurance of every product applied. 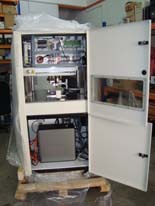 Servo Drive Precision Each system is sup- plied with a servo electric drive with force feed- back control. Force capacity is available up to 3 tons [27 kN] to handle a range of compliant pin housings and connectors on the market today. Compared to pneumatic or hydraulic systems, the SEP is quiet, efficient, and does not suffer from oil leaks that can damage PCBs. With PC control, the servo driven SEP provides an easily programmed press system with automatic set up from press cycle to press cycle. 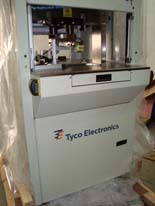 The system reaches levels of precision and accuracy not available in a pneumatic or hydraulic press. 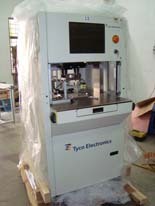 Monitor and Control For Quality Force, dis- tance and speed are the core parameters of any press cycle. With feed back and PC control, SEP systems can monitor and control each character- istic of every press stroke run on the press in real-time. If any aspect of that press cycle is out- side of specified limits, the system can stop the press, mid-stroke, to prevent damage to the product and reduce or eliminate scrap. This gives SEP systems a distinct advantage over pneumatic or hydraulic systems which can not offer the same level of control. Optional pin penetration sensing (PPS) tools also allow the SEP to assure that every pin has properly penetrated the PCB a predetermined minimum distance. Any missing, bent or improp- erly seated pins will be detected and illustrated to the operator. 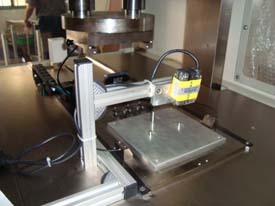 Faster Processing The SEP is supplied with an automatic product shuttle that locates the product stack up under the ram and upper inser- tion tool. The operator loads the PCB and hous- ing\connector into a lower support fixture that is mounted on the shuttle and hits the start switch. The system assures part presence and then shuttles the product under the ram mounted upper tool to complete the press cycle. This allows the system to automatically press the product while the operators hands are free to perform other tasks such as preparing the next product to be applied. The end result is increased quality by assuring proper product location and decreased processing time. 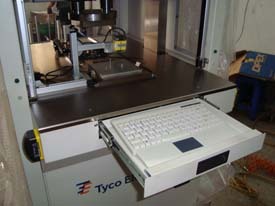 Eliminate Operator Error Quality is provided not only through the monitoring and control of the press cycle, but also through the avoidance of operator error. 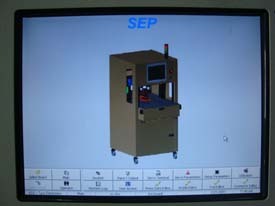 By pre-programming the parameters of the product applied, the SEP will automatically adjust set-up parameters from one press cycle to the next. There is no need for (and therefore no chance of operator error asso- ciated with) adjusting stroke stops or force adjustments from one cycle to the next. Even simple errors of using the wrong product can be eliminated to assure proper application and avoid costly scrap. 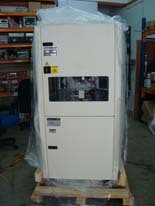 Shuttle servo electric press for the application of compliant pin products. Typical applications include the application of PCBs to compliant pin housings and connectors. System is capable of monitoring and controlling the force, distance and speed of a press cycle and maintaining quality records of every press cycle in real-time. Optional pin penetration sensing tooling can assure the proper location and pene- tration of every pin applied through the PCB. Speed – Application dependent. Typical time for shuttle in, press and shuttle out is 6-10 seconds. Standard (non-sensing) and PPS (pin penetration sensing) tools are available. product, while the press cycle is com- pleted automatically. This helps reduce scrap associated with improperly positioned products as well as increases overall process throughput. that every pin properly pene- trates the PCB by a predeter- mined distance. Coupled with force monitoring, PPS tools give assurance of the proper loca- tion, penetration and application of every compliant pin on every product applied. The PPS check is performed in real-time without the need for an additional or destructive quality test. er application or error information. 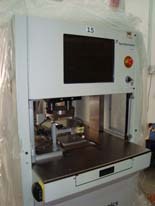 A picture of the end product can also be used to guide the operator through the press- ing sequence to reduce operator error. Dimensions: 38" x 30" x 64"